Anderson pictured via the J. Willard Marriott Library. "L. Clyde Anderson (b. 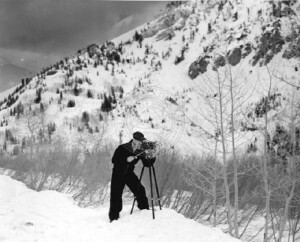 1895) was a commercial photographer and cinematographer in Utah. While he was in grade school, he developed a passion for photography and motion pictures. In 1919, he created a theatrical stage advertising show for movie theaters. This show allowed Anderson to refine his craft as a photographer and motion-picture technician by enabling him to produce and film all the advertising trailers. He opened L. Clyde Anderson Film Laboratory in 1934, specializing in commercial film and photography. Through his hard work, Lewis became a respected and popular producer and photographer. He produced hundreds of commercial films, and his photographs have appeared in numerous periodicals and newspapers" Archives West. For information on The L. Clyde Anderson Films, contact Special Collections at the University of Utah Marriott Library. The Marriott Library also holds the L. Clyde Anderson photograph collection, 1910-1959 and the L. Clyde Anderson papers, 1935-1959.